Arizona Party Tunes we understand how difficult balancing your dream wedding and your budget can be and we would like to assist you with accomplishing both. As your entertainer I am unique because I provide you with a full service experience. To accomplish this, as your Disc Jockey I will serve as master of ceremonies, wedding planner, disc jockey, and entertainer on your special occasion. Arizona Party Tunes will work with you from the beginning of your first consultation to the very last song to ensure your wedding day has been customized to exactly what you had dreamed it would be. What Makes us Different You will have the opportunity to meet with me before signing anything to ensure that my personality fits your style. We have the most creative interactive events in the area, which will make your night memorable Our pre-planning questionnaire is thorough and ensures a smooth, stress free event. I will create an agenda with a timeline that will break down your events. I will provide copies of this agenda to all of your vendors to ensure your event runs smoothly. We feel that your special event is deserving of top quality, reliable equipment, We always bring back up equipment just encase. We also bring a special system for Ceremony's. If Client cancels**Deposit is Non- Refundable** In order to prevent liability resulting from accidental injury to any individual attending this performance, Arizona Party Tunes reserves the right to deny any individual access to recordings or equipment owned or leased by Arizona Party Tunes. In the event Arizona Party Tunes feels a hazardous situation exits, upon notification, it will be Clients responsibility to take action to remedy the situation. If no action is taken, Arizona Party Tunes may delay or stop the performance until the situation is resolved. In such a situation, Client agrees to pay Arizona Party Tunes for all lost performance time. Client will pay for entire performance in the event that the performance is stopped and not resumed. Client agrees to indemnify and hold harmless Arizona Party Tunes from any and all liability for personal injury and property damage, which may occur during set-up, performance, and/ or breakdown/ removal of equipment. Client assumes full responsibility for all theft and / or damage to Arizona Party Tunes equipment, whether leased or owned. “Equipment” includes, but is not limited to, speakers, mics, mixers, amplifiers, compact discs, compact discs players, lighting, stands, and cabinets. Arizona Party Tunes encourages Client to request specific music selections for play during this performance. Please submit request at least (15) Days prior to performance. Arizona Party Tunes will make every effort to play all requests, but cannot be held responsible for specific selections not actually played due to lack of availability. Unless otherwise requested by client, remaining music will be selected based on popularity, danceable, and demographic appeal. 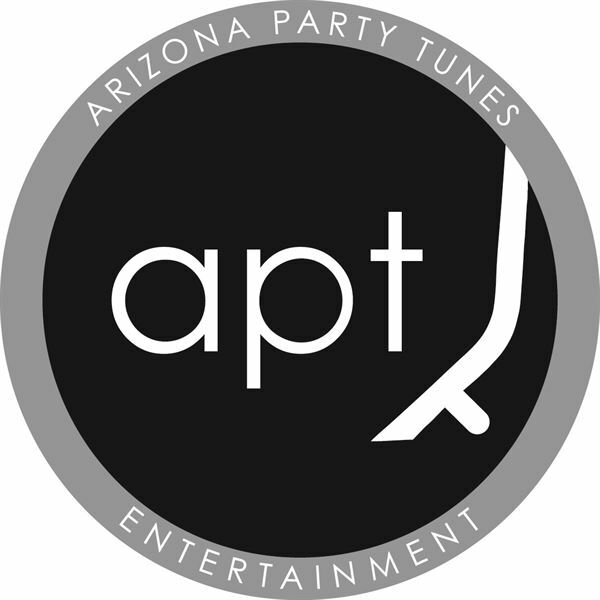 Wedding Ceremony & Plus 4 Hour Reception: $ 1295.00 Additional Hour: $650.00 Arizona Party Tunes Entertainment have been providing services for weddings since 1998. Our services are very detailed, and are specially customized to meet, and exceed the standards for each family that embraces the marital circle. Due to the details and effort put forth in these services, the price list will not meet to everyone’s budget. However, we strongly encourage you to meet, in person to discuss, create and show you the difference our service and expertise does provide. Remember you are the client and this is a lifetime memory! Weddings are to be a very special day, for everyone. I recommend that each client meet with at least 2 DJ companys before signing up with our company, the DJ personality needs to fit your personality and needs. Deposit can be paid with a Credit Card; there is an additional 5% charge. Balance must be paid by Cash, Cashier’s Check, Money Order and Credit Cards / Debit cards accepted, Credit Card / Debit cards final payments have an additional 5% charge processing fee added. If Client cancels**Deposit is Non- Refundable** In order to prevent liability resulting from accidental injury to any individual attending this performance, Arizona Party Tunes reserves the right to deny any individual access to recordings or equipment owned or leased by Arizona Party Tunes. In the event Arizona Party Tunes feels a hazardous situation exits, upon notification, it will be Clients responsibility to take action to remedy the situation. If no action is taken, Arizona Party Tunes may delay or stop the performance until the situation is resolved. In such a situation, Client agrees to pay Arizona Party Tunes for all lost performance time. Client will pay for entire performance in the event that the performance is stopped and not resumed. Client agrees to indemnify and hold harmless Arizona Party Tunes from any and all liability for personal injury and property damage, which may occur during set-up, performance, and/ or breakdown/ removal of equipment. Client assumes full responsibility for all theft and / or damage to Arizona Party Tunes equipment, whether leased or owned. “Equipment” includes, but is not limited to, speakers, mics, mixers, amplifiers, compact discs, compact discs players, lighting, stands, and cabinets. Arizona Party Tunes encourages Client to request specific music selections for play during this performance. Please submit request at least (15) Days prior to performance. Arizona Party Tunes will make every effort to play all requests, but cannot be held responsible for specific selections not actually played due to lack of availability. Unless otherwise requested by client, remaining music will be selected based on popularity, danceable, and demographic appeal. Wedding Reception Only: $ 1045.00 / 4 Hours Additional Hour: $500.00 Arizona Party Tunes Entertainment have been providing services for weddings since 1998. Our services are very detailed, and are specially customized to meet, and exceed the standards for each family that embraces the marital circle. Due to the details and effort put forth in these services, the price list will not meet to everyone’s budget. However, we strongly encourage you to meet, in person to discuss, create and show you the difference our service and expertise does provide. Remember you are the client and this is a lifetime memory! Weddings are to be a very special day, for everyone. I recommend that each client meet with at least 2 DJ companys before signing up with our company, the DJ personality needs to fit your personality and needs. Arizona Party Tunes was so much fun and professional. David came to the event early and set up and went over the Event agenda to make sure we were all on the same page.. He made the event so much fun and kept people dancing all night..